This is the double-arm “barn door” drive which I invented many years ago. To get the complete story on this innovation read my article from Sky and Telescope magazine Feb.1988 and the follow-up article in April 1989 reprinted below with the kind permission of Sky and Telescope Magazine. This device is designed to make it possible to photograph the stars with an ordinary camera, a couple of boards, some hinges and an inexpensive clock motor. The one in the photograph is my Type-3 barn door. 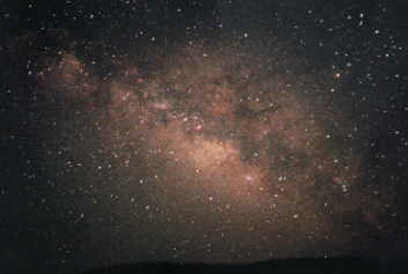 A simple device like this can produce stunning photographs like this one of the Milky Way. 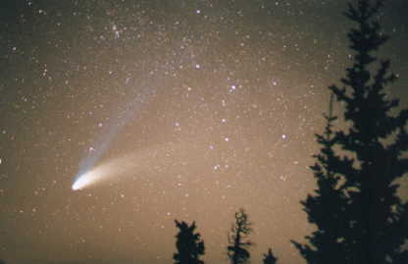 Or this one of comet Hale-Bopp. The barn-door mount whether single-arm or double-arm is a very simple, inexpensive device. The original, single-arm barn door has been around for many years and was, I believe, first popularized by a fellow named Haig back in the 1970′s. It is sometimes called the Haig or Scotch mount. My improvement in the double-arm version was designed to make the tracking very precise, which is important for astrophotography. 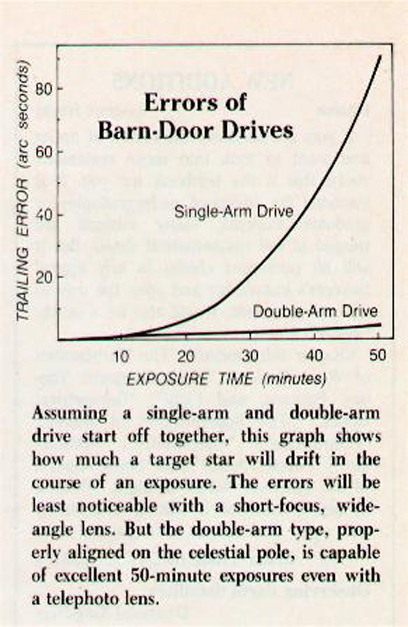 But even imprecise tracking, like that provided by the single-arm barn door, can be very useful when doing visual observing. I have received many, many letters and emails about the Double Arm Barn Door since the article was first published in 1988. The concept is fascinating to a lot of people. Some could not resist performing a complete mathematical analysis. Others became interested in simply building one to see how well it worked. That was my situation back in 1988. When I started to analyze the situation I wrote a program for my Commodore 64 computer that would allow me to run various examples until I found a successful design. My investigations showed no substantial benefit from the Type 1 and Type 2 configurations. But the Type 3 showed remarkable promise. I got so excited about the Type 3’s astounding results that I neglected the Type 4. I did an analysis of the Type 4, but I made a mistake somewhere along the line and somehow missed its even better performance. Others later investigated the Type 4 and showed that it is even better than a Type 3. I could not wait to try the Type 3. So I quickly built one and took it to a dark sky site. The prototype was not pretty and I can remember the strange looks I got from some of my fellow amateur astronomers when they saw it. (The one pictured is a beautified version.) Anyway, I made several discoveries about the need to “tune” this device. Polar alignment is fairly important and the tracking rate must be tuned at “close to” 1 RPM to optimize the performance. Small construction errors (tiny fractions of an inch) change the needed drive rate slightly. They do not substantially affect the reduction in the tangent error. I remember taking the prototype to the Riverside Telescope Makers Conference in 1987. Most people did not pay much attention to it because it looked so crude. I was very gratified when, at Riverside the next year after the article was published, I saw many “Trott Barn Door Trackers” built by fellow amateur astronomers from all over the country. I think one of them won an award. Here are the two articles from Sky and Telescope Magazine in February 1988 and in April 1989. Copyright 1988, “Sky and Telescope” Magazine, published with permission.Thank you, “Sky and Telescope”! 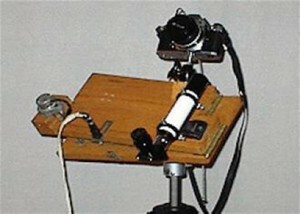 Camera drives of the barn-door or tangent-arm type are simple to make and easy to use, but they have intrinsic error. They try to convert the uniform motion of a nut, traveling along a straight threaded rod, into uniform angular motion of the camera board. Such a conversion is always inexact, and the error can’t be entirely eliminated by any simple mechanical means. However, my new double-arm version is much more accurate than the single-arm type. This is an example of two wrongs making a right. A major portion of the error in a standard barn-door arrangement is cancelled by the error in the coupled secondary arm! The double-arm principle may be applied to a camera drive of any size or construction with the same beneficial results. When I first thought of this idea, I sat down with a pencil and paper and tried to analyze the situation mathematically. An hour later I found myself staring at a page filled with insoluble equations. A numerical approach was obviously called for, so I wrote a program for my Commodore 64 computer that would allow me to run various examples until I found a successful design. First consider a typical single-arm drive, sketched at top in the diagram at left. Two boards are joined by a hinge at one end and a threaded rod at the other. A motor attached to one board turns the rod at a constant rate, and because the rod is engaged in a nut on the other end the two boards slowly swing apart. For astrophotography, one board is bolted to a tripod or propped up at such an angle that the hinge axis points to the celestial pole. The camera is then fastened to the other board. As the motor turns, the camera tracks the stars — at least that’s the idea. Success depends on how accurately the hinge axis is oriented and on whether the angular motion of the board matches the diurnal drift of the stars across the sky. The Sun moves 15 degrees per hour, the stars 15.041 degrees per hour. There are several ways to attach the motor, threaded rod, and nut so they don’t bind as the boards swing apart. In my drives, I put the motor on a small platform hinged to the end of the camera board. The nut is recessed in the other board so it can tilt slightly to suit the “angle of attack” of the threaded rod. Thus the rod becomes the base of an isosceles triangle. As the motor turns, the rod’s effective length a grows at a constant rate and the triangle fattens with time. Unfortunately, the hinge angle theta does not change at a steady rate, as desired for astrophotography. The camera starts off tracking almost perfectly for several minutes, but then it gradually speeds up, “overshooting” the stars and causing their images to trail in a longer time exposure. Other methods of attaching the motor, threaded rod, and nut behave somewhat differently. For example, the tracking may start uniformly and then slow down. But there’s no escaping the fact that a single-arm drive, when powered by a straight threaded rod and constant-speed motor, fails to allow high-class astrophotography if the exposure time exceeds 10 or 15 minutes. In a double-arm drive the original arm still carries the motor and threaded rod and makes an angle theta with the fixed board, as before. But now we move the camera to an added second arm, driven by the first and inclined to the fixed board at a different angle, phi. We are looking for a smooth, linear change in theta with the growing rod length a. The diagram shows the four possible double-arm configurations and the equations that describe how well they track. In each case there are two fixed dimensions labeled b and c. I define the parameter beta as equaling the ratio b/c. My computer program began by asking me for a trial value of beta. Then, for a series of values of a increasing in small steps, it calculated first theta, then phi, and finally the difference between a uniformly increasing angle and the calculated phi, or tracking error. While I was running this computer simulation of drive type 3, I spotted a long series of very small errors when I plugged in a value of 6 for the parameter beta. The output suggested that tracking would be excellent for nearly an hour! Indeed, the chart above shows that the tracking rate is considerably more accurate than that of a single-arm barn-door drive. Next I built the new double-arm mount and attached it to my stable “tetrapod” base (S&T: October, 1987, page 426). I then bolted on a camera and used a 6 x 30 guidescope to fine-tune the motor’s rate with a power inverter. When satisfied, I opened the shutter and made test exposures with only occasional adjustments of the inverter. The resulting pictures were of comparable quality to those obtained in piggyback photography on a standard equatorial mount. where r.p.m. is the motor speed in revolutions per minute and t.p.i. is the number of threads per inch. A small corner piece of Teflon is the only contact between the two arms. The camera-arm contact area is covered with linoleum to minimize friction. I like to begin an exposure with the camera arm’s hinge angle near 30″, since this is where the tracking accuracy is highest in the drive that I built. 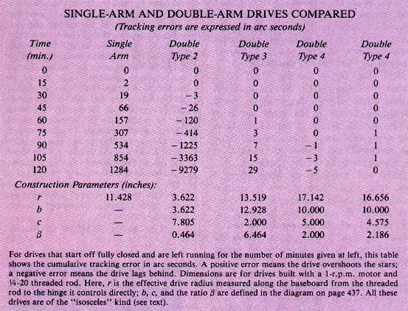 Of the four possible configurations of double-arm drives, I found that only types 2 and 3 had solutions yielding increased tracking accuracy. For type 3, the ideal value of the parameter beta is 6, as already mentioned. But for type 2 the optimum is 0.5. I would appreciate readers’ comments, both theoretical and practical, on the double-arm idea. The following article is from Sky and Telescope Magazine , April 1989 pp. 436-441, Copyright 1989, “Sky and Telescope” Magazine, published with permission. The appeal of a barn-door drive is almost irresistible. It is a solid platform for time-exposure astrophotography with a small camera. You get two boards, join them with a hinge on one end, and slowly push them apart by turning a threaded rod at the other. If the lower board is clamped to a tripod, fencepost, or whatever, with the hinge axis pointing to the celestial pole, any camera on the swinging board can follow the stars across the sky. The idea probably got its start in the 1930′s when Harvard astronomer Donald Menzel was mounting solar-eclipse expeditions. Suitable for any latitude, a barn door can carry the most outlandish array of eclipse experiments without needing delicate balance or counterweights. A total solar eclipse never lasts more than 7% minutes, and in that time the tracking accuracy is quite excellent. But such a drive (sometimes called a tangent-arm drive) can’t track forever.Eventually the angular motion of the top board fails to match the linear motion of the screw pushing on it — an inevitable consequence of geometry. The amount of “tangent error” depends on the details of how the screw is attached, but there is no escaping it. Some astrophotographers, seeking error-free time exposures of 20 minutes or more, have explored ways to turn the screw at a progressively different rate to compensate for tangent error as the boards swing apart. Others have introduced a special curved surface (cam) for the end of the screw to push against. Then in Sky & Telescope for February, 1988, page 213, Dave Trott (who now lives at16825 E. Kenyon, Aurora, Colo. 80013) opened a whole new chapter on the subject by exploring a family of simple drives with not one but two hinged arms. One arm pushes on the other. Trott’s article brought a flurry of correspondence to cleanings for ATM’s, the likes of which we haven’t seen since the early days of the Poncet platform in 1977. Some readers headed straight for basement workshops and soon sent photographs taken with their own double-arm drives. Others, whose mathematical curieosity had been piqued, submitted reams of handwritten calculations and printouts. Here we present some of these interesting results from around the world. South Africa, D. P. Smits of the University of Cape Town has also explored the accuracies of various configurations. His paper, “A Mathematical Analysis of the Double-Arm Barn-Door Drive,” appears on pages 155-160 of the December, 1988, Monthly Notices of the Astronomical Society of South Africa. 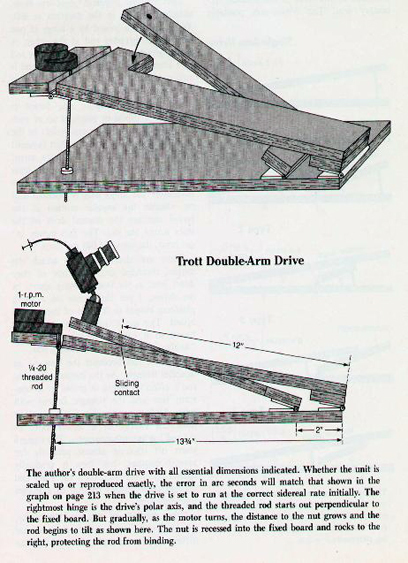 Smits notes that all of Dave Trott’s drives, including the single-arm version, have the drive screw mounted as the expanding base of an isosceles triangle. He derives the same three ideal construction ratios found by Hairie (0.464 for Type 2, 6.464 for Type 3, and 2.0 for Type 4). But Smits comments that still other solutions, some equally good, exist when the drive screw pushes straight up from the fixed board and forms a right triangle instead. His address is Dept. of Astronomy, University of Cape Town, Rondebosch 7700, South Africa. In the February, 1988, article, Dave Trott recommended adopting a 1-r.p.m. motor and 1/4-20 threaded rod. If so, he said, the parts of a Type 3 drive should be spaced so that r = 13-3/4 inches, b = 12inches, and c = 2 inches. How do these values change in light of the further analyses by Cox, Hairie, and Smits? With the hinge spacing fixed at 2 inches, the change of beta from 6 to 6.464 means that the sliding-contact point should lie 12.928 inches from the drive hinge, not 12. But now the camera arm will swing too slowly unless we also move the threaded rod inward; it should be 13.519 inches from the drive hinge. This will produce an ideal Type 3 mounting whose performance is summarized on page 440. Tracking is now virtually perfect throughout the first hour, at the end of which the camera board is “fast” by just 1 are second. Then the error grows. A 1-1/2 hour photographic exposure will have star trails 7 are seconds long. But this is less than 0.0003 inch on film exposed with a 200-mm telephoto lens — virtually imperceptible on any reasonable enlargement. Even a 2-hour exposure with the same lens would have trails only 0.001 inch long on the film. The table compares this performance with a single-arm drive as well as double-arm types 2 and 4. We see that Type 2 is only a little better than a single-arm drive during the first hour. Then it fails miserably. It also needs a rather small drive radius, and rugged construction would be necessary to carry any but the lightest camera. However, Type 4 drives are quite another story. Their performance is truly astonishing. While the table rounds off errors to whole are seconds, a careful calculation using Alain Hairie’s beta = 2 shows that his drive will track to 0.005 arc second for half an hour! At the end of an hour, it is still good to 0.159 are second. The last column illustrates how a slight variation of Hairie’s ratio, to betsa = 2.186, can push the “perfect” tracking all the way to two hours, as long as we are willing to relax our expectations in the middle of the exposure. Now the worst error occurs near the 90-minute mark, and it amounts to just 0.8 are second! The mathematicians have had their say, and now the ball is in another court. Can anyone build such a phenomenally accurate barn-door mount? How precisely must the hinges be spaced from each other and aligned on the celestial pole? Fortunately, perfect construction is not necessary. Atmospheric refraction will shift the stars at least 15 are seconds in a one-hour exposure, even when we photograph the sky overhead. A drive made to track perfectly in one part of the sky will fail to do so in another. But these are problems affecting all telescopes and astro-cameras, not just barn-door drives. Whether you build a Type 3 or Type 4 unit — they’re both excellent — be sure to include a means of adjustment. The last two columns of the table make the point: a half-inch change in spacing c is compensated by a similar change in r. Remember this trick when trying to correct a slight construction error.In the end, the best way to get the tracking accuracy “dead on” is not to move the hinges or tamper with the motor support, but to find the proper motor rate. A synchronous motor’s base rate can be altered slightly with most commercial or home-built drive correctors. Rate adjustment is also simple with the Holbrook stepper-motor circuit. Read more about the Double-Arm Drive and get plans in Stephen Tonkin’s wonderful book Amateur Telescope Making , ISBN 1-85233-000-7. Also see a brief discussion in the fascinating book Unusual Telescopes by Peter Manly, ISBN 0-521-38200-9. A unique innovation developed by Rowland Cheshire enhances the accuracy of the double-arm drive as explained at his site. If you are serious about precision, check it out.